“The gaming industry in India is growing at a rapid pace. Especially given the rapid adoption of cheap smartphones in India combined with the very affordable high-speed internet, the gaming market in India is exploding with growth. The market is no longer limited to children but Indians of all ages are hooked onto games,” expresses Rajeev Chilaka, President TVAGA & Founder of Chota Bheem fame GreenGold Animation. 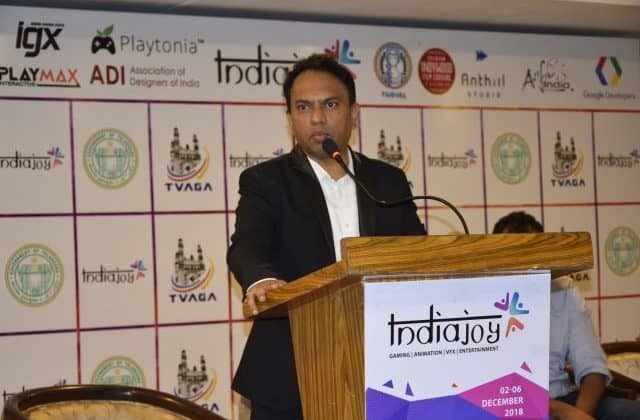 Rajeev Ckilaka is facilitating IndiaJoy 2018, a gaming event that will make its debut at HICC and HITEX in Hyderabad. It’s a 5-day event supported by Government of Telangana and Telangana VFX, Animation & Gaming Association (TVAGA) during December 2nd – 6th. According to Chilaka, IndiaJoy will bring all the creators of games along with the entire ecosystem of programmers, platforms, animators and business guys together not just from India but from across the world. This is going to enable cross-pollination of ideas for gaming enthusiasts of different age groups, companies, nationalities and seniority levels. Young innovators can attend the relevant tracks, speeches and networking events designed to help the industry as a whole grow. Chilaka and other key organizers say that IndiaJoy will for the first time ever, under one platform, witness the convergence of India Game Developers Conference, Unite India (Unity), Indywood (Film & VFX), Indian Games Expo (IGX), ASIFA CG Meetups, Animation Express, Playmax eSports, Google Developers Day, Association of Designers of India (ADI) including a number of interesting and exciting activities. Hence, the Government of Telangana sees this event as a big boost to the gaming industry and has taken the stride to be the principal promoter of this event. IndiaJoy is also facilitated by Telangana VFX, Animation & Gaming Association (TVAGA) – a non-profit association established to promote & support the growth of Animation, Gaming & Visual effects industry. The Gaming, Animation Digital Media and Entertainment week will kick off with Asifa CG Meet up on 2nd December. A series of daylong events on 3rd, 4th, 5th and 6th December, featuring Google Day, Indie Game Developers Day, Animation Express-Investor Connect are some of the other highlights of the event. This event will showcase Unite, Virtual Augmented Mixed Reality, Indywood, and Indian Gaming Expo. Every day, the evening will culminate with Hyderabad Music Festival. An e-sports carnival in association with Playmax is another attraction with a range of PC games, Console games to indulge. The event hopes to attract a large number of gaming enthusiasts with its PlaymaxESports Carnival, which will feature games like PUBG, WWE, FIFA, LoL, DoTA, and Counter-Strike. Green Gold’s Rajeev Chilaka pegs IndiaJoy to bring cross-pollination of super gaming ideas 0 out of 5 based on 0 ratings. 0 user reviews.